Sky Blues star of the 1960s and Coventry City Former Players Association committee member Dietmar Bruck will be the Association’s special guest at the Sky Blues important home game at the Ricoh next Tuesday night (2nd October 2018). The Sky Blues take on Portsmouth in a match the Sky Blues will want to win to show they can hold their own in League One with other top sides in the division. Pompey are, of course well known to current CCFC skipper (and CCFPA member) Michael Doyle as he was also central to their promotion push the season before last when he led the Sky Blues out of League Two. Ron Farmer & Dietmar Bruck lift the 1966-67 D2 Champions Cup again! 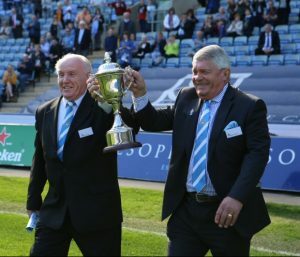 Dietmar is a regular at our Legends Days and played a particularly prominent part in our 10th Anniversary Legends Day programme in 2017 (when we beat ‘the Posh’ 1-0) and was pleased (left) to parade a replica of the 1967 D2 Championship Trophy he won with his colleagues on the Ricoh pitch. All will hope that Dietmar’s presence will encourage the Sky Blues to a confidence boosting win. 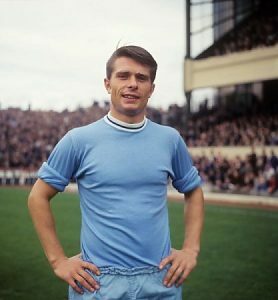 Dietmar, of course, was one of the few City players who in his eleven years with the club from 1960-71 rode the ‘Sky Blue Express’ under CCFPA member and Club icon Jimmy Hill all the way from apprentice and the old Division Three to the top (Division One) before moving to Charlton Athletic. The stalwart defender was brought up in Coventry (at Bishops Ullathorne School) and Dietmar’s tussles with clubs from Manchester were a recurring feature of his career. He was the club’s first ever substitute against Manchester City when the system was introduced in 1965. He also won’t like being reminded that he became the first City player to be sent off in the top flight in September 1967 (also against the ‘other’ Sky Blues). Dietmar will always be remembered for his wonderful long range goal which contributed to a stirring fifth Round comeback against higher league Sunderland in the Club’s F.A.Cup run of 1962-63 when both Dietmar and fellow CCFPA member George Curtis scored late on to clinch a 2-1 victory and a home 6th round tie against Manchester United. Dietmar is also proud of taking part in CCFC’s sole European campaign in the European Fairs Cup in 1970-71. In total the stalwart Sky Blue defender clocked up 217 first team appearances for CCFC in over a decade with CCFC scoring eight times. Dietmar is a long-standing member of CCFPA and no stranger to the various duties and expectations we make of our special guests. As there will be no Family Zone for the evening game Dietmar will spend more time pre-match touring the executive lounges in the company of fellow former Sky Blue defender (and CCFPA member) Brian ‘Harry’ Roberts. After the game we are sure he will give as good as he gets when ‘grilled’ (in the friendliest possible way) by CCFPA colleague Billy Bell on the stage of Lady G’s at the G-Casino. Dietmar will also provide matchday analysis on BBC CWR for the game. So whether you are part of the Ricoh Roar or listening in away from the Arena make sure you make Dietmar part of your game plan. Dietmar, hope you have a great Ricoh night under floodlights!